jcaiken: Thanks for the suggestions but these entries really aim to just be a summary of the application. There's really no way to make sure we're highlighting all the tech, features, and difference from other applications, but you're right that the ad-bocking by default is notable so I'll add that in. Also, should note that the included "VPN" is really just a proxy. 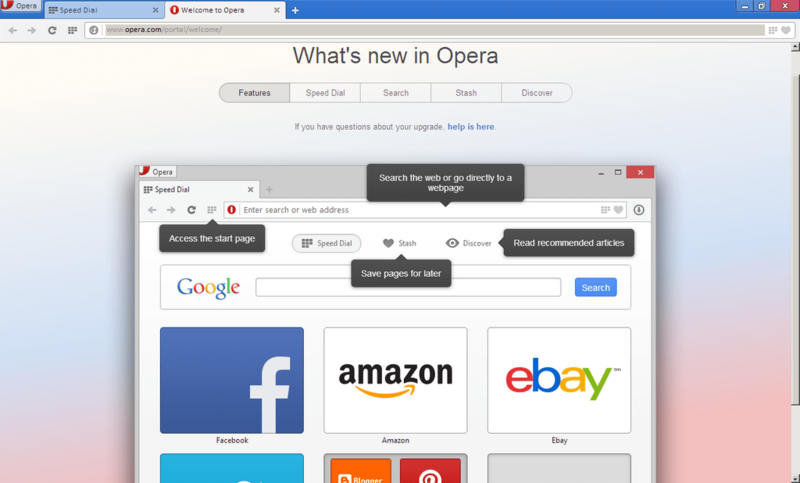 Opera is built on Chromium, the open-source version of Chrome, and as well as having its own extensions is compatible with most Chrome extensions (but not Chrome Applications). The reference to the older version of Opera (v12) should also identify that it also lacks many of the modern features that are only available in the newer versions, e.g. Chrome compatibility, built in ad-blocker and free VPN, etc. Deleting "Add site" button on start page will stop ads being added. Use address bar icon to add to speed dial, or bookmark. Setup for portable and desktop 45, used a temporary folder for portable version, copied everything except profile to portable Opera folder. While in private mode, clear browsing history. Spectacular crash. Correct version is v31.0.1889.174 (not v31.0.1899.174). During install, one can choose Portable mode. Ive tested Vivaldi, but it has some way to go before it gets up to Opera v12.17. Sorry Guys, (and Gals), fuzzy thinking strikes again, I didn't look properly and missed the 'Options' button. I just downloaded the OffLine version, (Opera_28.0.1750.51_Setup.exe), but when I ran it there was no installation choice. Works fine for me, don't see why it would not work for you. When I download, I am not given an option to choose a Stand Alone Installation. @smaragdus What was the latest version you tried? Version 15? We are now at version 27 and in my opinion it's an excellent browser. Starting from version 15 Opera is no longer Opera and it should not be called Opera. In fact this is the worse browser ever, the worse Chrome clone and even worse than Internet Explorer itself. The real Opera died at version 12.
to install Adobe Flash, create a "plugins" folder in "15.0.1147.153". - Opera stores it's settings in the application folder. Now as for the PW, i don't think that is what TPFC really tests for. Like Mr.JohnTHaller said, v15 not fully portale, what if when I move to a new computer, all my password get destroyed. "As a note if the entry is updated to Opera 15 or for folks who may use it instead: some features like saved passwords are PC-specific due to the switch to the Chromium engine and will not work in Opera 15's portable mode. They'll save when you're on the current PC but as soon as you move PCs, all your passwords are wiped out." at first glance, Opera 15 seems more like a downgrade. all the settings i loved in Opera are gone. either that, or they've hidden it somewhere. the only settings available under settings are basic settings. As a note if the entry is updated to Opera 15 or for folks who may use it instead: some features like saved passwords are PC-specific due to the switch to the Chromium engine and will not work in Opera 15's portable mode. They'll save when you're on the current PC but as soon as you move PCs, all your passwords are wiped out.